Vegetable growing - I have always been slightly obssessed with all things green and home-grown or made, ever since I was a wee girl growing up in the Clyde Valley in the west of Scotland. I spent my childhood watching my paternal grandparents grow, build, make, bake, preserve, bottle and nurture (children and animals included), just about anything you could think of, and many things you would not expect. This inspired in me a desire to see if I could be as productive as them with vegetable growing, or even half as productive, and a love of all things "homely". My ultimate dream is to live on a smallholding or croft somewhere, raising my family alongside our own fruit, veg and small livestock. Presently, however, at our home in Maryhill in Glasgow, a tiny patch of dirt, (the use of gifted from my generous neighbour), some spare strips of ground under some trees/between pre-existing plants and all the containers I can get my hands on suffices for my vegetable growing! The wee plot where I have do most of my vegetable growing is a tiny (approximately) 5ftx8ft space, that among other things has had gorse bushes, ivy, trees and the beginnings of a rockery growing in it, so as you can imagine, took A LOT of clearing and digging out for such a small area. Whole slates, endless stones, roots, rusty nails, polystyrene blocks?! chunks of glass and the tops of several cans are among some of the things I found while digging it over for the first time this spring. Although I managed quite successfuly to grow some courgettes and 2 potato plants in it last year, only a small part of the ground had been worked, due to my humungeous baby belly at the time stopping me from bending over to dig properly. Presently vegetable growing in the veg patch consists of 8 brussels sprout plants, 2 small rows of mixed root veg, (carrots, parsnips and leeks), some marigolds to attract aphid-eating ladybirds, a small row of spinach beet, a small row of leeks, a small row of intermingled carrots and radishes, and 2 small rows of swedes. There are also some Grampa Ott flower seeds in there somewhere as I read that they also attract ladybirds. The radishes have been coming along nicely and will be ready to harvest in the next week hopefully. I did have a problem with a certain neighbour's cat pooping in the patch every night despite my best cleaning-up efforts so now it's protected by some chicken wire. Also in the front garden there are pots with peas which are coming up more every day now, sweet peas and a lavander plant which I am still deciding where to put, so is in the sunniest part of the garden. I also recently purchased a wee plastic greenhouse to help in my vegetable growing, that currently houses courgette, french climbing bean, sweet william and mixed salady type plants, and french dwarf bean and pumpkin seeds which we are waiting to germinate. I will also be putting some chilli plants and a peanut plant in there once I have transplanted the others out to make space, and when it warms up just a little bit! Round the back I have 6 potato plants in a strip of ground under some trees, 4 in pots, a mixed herb pot, a mixed salad pot and a pot with carrots and radishes approx 2 weeks in front of the ones in the patch. There is also some mixed fruit bushes but they're only in their 2nd year so I don't expect anything harvestable from them this year. Although it sounds like lots, I only have a small number of each type growing, and since this is the first year that I have attempted to grow most of the stuff I don't know how my vegetable growing will turn out. It's more of a wee experiment until I have more experience and knowledge of what my garden can cope with! Oh, and also on occasion we find a present from the, probably quite disgruntled, cat so not sure how that will affect our plants! I dug some organic chicken poo pellets into the ground about 6 weeks before I planted any seeds, as I was pretty sure the ground under the trees especially wasn't of the best quality, and the potatoes under there are looking healthy and strong. The other wee plants took a while to get started, and the first 8 brussels that I planted out strangely dissapeared one night, but they all seem to be doing well now. I did sprinkle plenty of slug pellets around, and I'm quite glad as every morning we look, my 3 year old daughter is delighted and horrified to find hundreds of dead/dying slugs and snails around them-yuk. Last year we picked them off and threw them down the drain but never seemed to catch them all, so I am glad I used the pellets, espec since there seem to be so many. The best thing about having my vegetable growing patch etc isn't just the fact that we'll be able to have food to eat that is fresher and healthier than anything we could buy from a shop, or that we're decreasing our carbon footprint, or that it's a fantastic excuse to get some time of my own where I can destress and THINK, or even the fact that hopefully it will in the long-run, save us some money. It's the sheer, unadulterated joy at watching something that I have, very simply, put in some earth, watered then examined every day with bated breath to see if it will indeed pop out of its wee seed casing, grow and get bigger and stronger and reach up to become something so much more than what it was before. 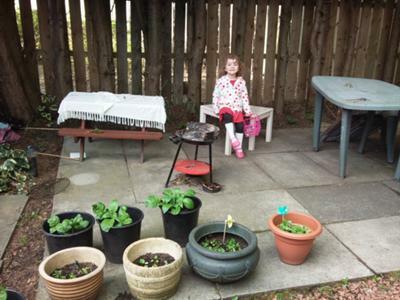 And of course the absolute wonder and surprise in Freya's voice and face when she realises that the wee seeds we planted are "wee plants mummy!". Fantastic. Stay posted to see how our vegetable growing and potato patches get on and some reviews on what's hot and what not to grow in Craigieburn Gardens... gardens! A quick update for the end of March. We FINALLY got two dry days together and I managed to rake the vegetable patch over(albeit after coming home from the nightshift...) and Freya and I planted some carrot seeds hooray!! The next day we did come out to find a big stinky cat poo in the middle of it but after throwing that down the drain and covering the patch with netting we havn't had anymore kitty surprises :) We also threw over some marigold seeds and some spinach inbetween so we're looking forward to seeing what happens there. The seed potatoes - bar 4(we ran out of big containers/bags for life/old buckets...! )have been lovingly planted by Freya and Theia, and the 4 spare were donated to Freya's nursery who grew some good specimens last year, so hopefully will be able to use them up. The lettuce seedlings and sweet peas are aclimatising and the spinach has also sprouted, despite being snowed on, flooded and manhandled by theia. Plans for the next couple of weeks: plant some shallots I saw reduced and couldn't resist, transplant the lettuce and sow the remaining tomato seeds I bought with a packet of gardeners delight I got free with a "Which!" magazine. Well, after deciding to only plant potatoes and carrots this year, I gave in and bought some lettuce, spring onion and spinach seeds! On the premise that they will hopefully do well in pots. We now have 18 double seeded propegator tray with wee lettuce seedlings coming up and four 4" pots with sweet peas on the windowledge. My plan is to singularly transplant the lettuce seedlings when they are big enough into 8" pots and hope for the best. The syboes(spring onions! )and spinach are sprinkled into medium pots out on the bench at our front door. Luckily enough, I thought to put a poly bag over them, because the day I planted them it snowed. It has since been a continual mix of sleet, snow and torrential rain since then, so it's anybody's guess if they will survive! I also bought a pack of mixed breed cherry tomato seeds yesterday. Having grown beefsteak toms from some spare plants my cousin gave me last year, and doing well off them for fresh toms and some green tom chutney, I've decided to plant up a few and see how we go. Any tips for these would be very welcome! And thoughts on upside down growing bags...??! Potatoes are chitting on the kitchen windowledge and looking good, but the ground is still too wet to get a decent rake at the soil for our carrot seeds. Unless it clears up SOON, I think it'l be a container or two at most for these. I have just bought my first seed packets of 2011, and am already getting excited at the thought of growing more veg this year. The potatoes that we grew in pots last year did VERY well, so we have decided to do them all this way this year. Today I bought Charlotte and Desiree seed potatoes. In the veg patch we are just doing some early cropping carrots and radish as we are hopefully moving house in the middle of the summer so will hopefully be able to harvest some young carrots etc before we go! Of course, pots of salad leaves and rocket will be planted out since they are easy to grow, harvest and transport(in their pots) without too much worry we hope :). We have been diligently composting our veg, teabags, coffee grounds and other waste all winter and at last peek had some lovely dark, crumbly compost in the bottom of the bin. Great to hear you had such a successful 2010 Sarah. Coincidentally I have just purchased Wilja and Kestrel seed potatoes to grow in my pots. I have growing in my heated propagator in the greenhouse some red and white onions, summer cabbage, shallots and brussels sprouts. I also have some lettuce plants for planting into the greenhouse border. Have a great 2011 and I look forward to hearing more about your vegetable growing exploits. Excellent grandparents, excellent work, excellent writing, excellent photos and now, excellent comments. Hello Sarah, just wanted to say how blessed you're to have such a great garden, you must have the green thumb syndrome. I too have always been fascinated with growing my own herbs and some veggies, but in pots. I got bold this year and in April I decided to do a small garden and planted zuccini, tomatoes, garlic, squash, lettuce, cabbage, onion, arugula, mesculn mix, and almost all the herbs because I am always cooking with herbs. Unfortunately, I don't know what happened because it seems nothing grew. I though I did everything right. I was told to equally mix 10 10 10, potting soil, manure, and sand, but it seems all the transplants turned brown and died. I am beginning to see some growth coming up now, but I'm not sure if it's weed or the plants beginning to grow. I was so disappointed because I had put so much money and back breaking work preparing and planting the garden and now it seems I have nothing to show for it. I really don't have the money now to do anything else so I am almost deciding to just let it go. I've still been watering it in hopes that it is the veggies growing, but my patience is becoming short and so I'm beginning to feel like there's really no point in me continuing to waste the time and water on it. Like I said before, I love cooking with herbs, so a few weeks ago, I re-purchased some basil, flat leaf and curly parsley and planted those in my pots on my deck and they're doing wonderfully. I already had chives and mint that came back from last year and they too are doing well in my pots, but as for that so-called crazy garden, I believe I've given up and I don't think I'll ever put in the work and money to do that again. But as for you and your garden, I'm sure it is great to see your time and effort create a beautiful and tasty garden, keep up the great work and continue to inspire those around you. If ever you can give me any tips then post them here in the comments section under your web page. Friends and family can also check out my facebook page for more pics of the garden. No wonder the human race continues, by showing such commitment and resourcefulness, Sarah - you are truly amazing. What a fantastic story of triumph over adversity (another name for slugs :0) ). And what a refined young lady Freya looks, reminds me of my little Abbie (26yrs old now and married) she was a 'pink' young lady and a lover of 'Victoria Plum'. One can't stress enough the importance of involving our children with growing vegetables. They learn in life by copying, my 3 married children (1 boy, 2 girls) like to grow plants including veg. So well done Sarah and thanks for the joy you and Freya have given us by sharing your amazing adventures in this area.